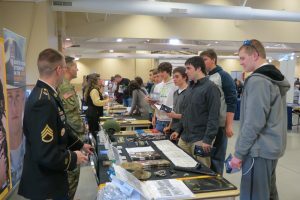 The Workforce Alliance was formed to help students at all grade levels understand the many and varied career opportunities that exist here in Washington County. We want to help students and parents understand all of the job and educational opportunities available, see how the two are related and then make the very important decisions related to what comes next after high school graduation. Researching this on your own may seem like a daunting task, but we want you to know that we’re here to help. We’ve been able to bring employers, both large and small, together with school districts (Hartford, Kewaskum, Slinger and West Bend), colleges and universities (MPTC and UW-WC) to provide you with resources to sort through all of the options and make the best decisions. Additionally, our social and human services partners will be able to help you access a vast array of support services where special needs exist. We’ve worked with employers to define critical skills needed in the workplace and collaborated with educators at all levels to insure that those skills are incorporated into the curriculum our students are taught. We’ll also be working to develop stronger Apprenticeship, Internship and Co-op programs to provide students with real world workplace experiences. Beginning in the 2017-2018 school year, all public school students in K-12 and union school districts in Wisconsin will be required to develop an Academic and Career Plan (ACP). Typically, this will be initially developed in Middle School with ongoing updates until high school graduation. This will help students and parents make appropriate course selections in support of the students future goals. The state of Wisconsin will be making software tools available to school districts at no charge to help everyone involved in the process receive the desired benefits of the ACP process. The Workforce Alliance will be collaborating with United Way of Washington County to provide a key piece of supporting infrastructure called INSPIRE that will allow students in any school district to communicate with employers in any part of the county. Watch for further updates on this exciting development! We encourage you to review the following statistics to get a better understanding of the challenges employers are facing when hiring new employees and to help guide you in conversations you may have with your children on how to prepare for the workplace. 58% of employers surveyed indicated they plan to expand in the next three years (2015-2018) and hire additional employees. 29% indicated that new employees do not fulfill necessary requirements in entry level positions. 30% indicated that entry level applicants struggle with basic skills, such as locating information, reading for information, and applied math and writing. 43% indicated that entry level applicants lack “hard” (technical) skills. 46% indicated that entry level applicants lack “soft” skills (habits and personality). 78% indicated they have rejected applicants because of background checks. 87% indicated they have rejected professional level applicants because of background checks. 85% indicated they have rejected applicants because they could not pass controlled substance testing. Nationally, 66% of high school graduates enter post-secondary education– a university or technical college. Of that number, only 25% graduate with a four year degree. 50% of graduates are under-employed– they are not working in a job related to their degree. A study done by the West Bend School District shows that we are aligned with national trends. They found that 62% of their graduates enter post-secondary education, and of that group, only 30% attain a four year degree. This video will provide you with important information regarding the decisions you and your child will be making as they prepare for the world following high school graduation. There’s a lot of information here and you may want to view this more than once to fully absorb what is offered.